Your heating and cooling systems play a vital role in keeping you comfortable in your home or commercial place. The best thing that you can do in return is to give them proper care and maintenance. 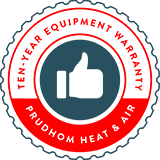 With this, you’ll be needing help from the certified technicians at Prudhom Heating and Air Conditioning. Our NATE Certified technicians are highly qualified and experienced in working with all makes and models of HVAC system. And they receive ongoing training to learn the latest advancements in the field.